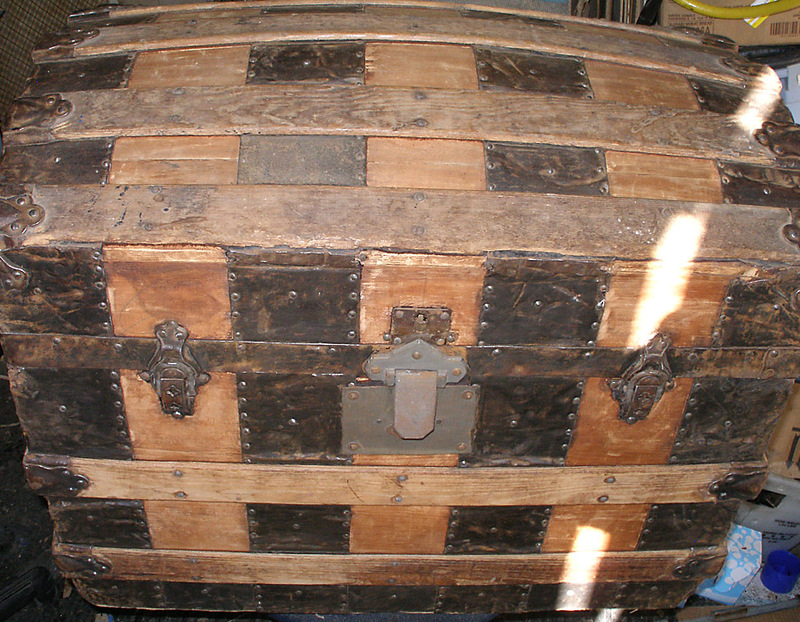 The following photos and descriptions are examples of some of our procedures we use, and challenges we face, during Trunk refinishing. 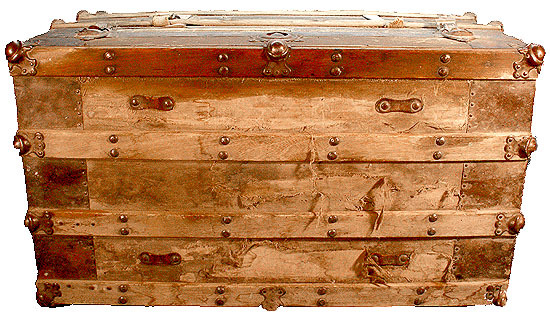 There are photos of different trunks, to show some of the various techniques. 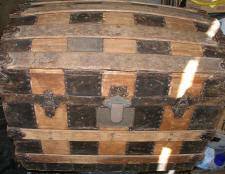 We are always excited about our next Trunk refinishing / restoration project. 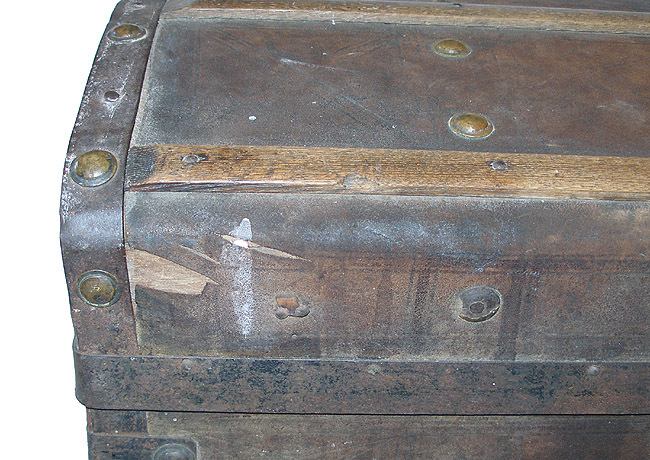 Considering the condition we received them in, and the work process we go through with the trunk, the final transformation is always rewarding and exciting. 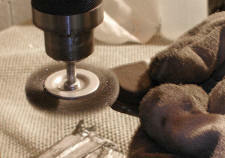 Now don't get me wrong, this is not easy work and not a simple process. 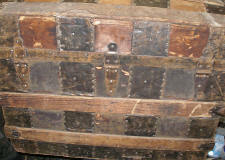 We realize that sometimes people will find an Antique Trunk which they would like to refinish themselves. 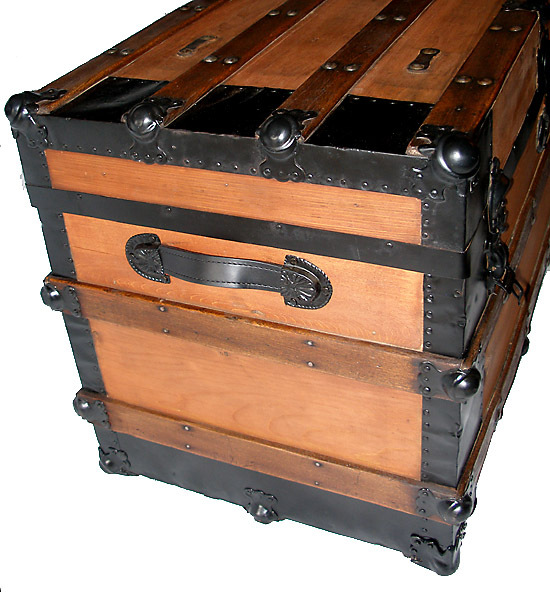 We love working on ours, and the trunks we refinish for clients. 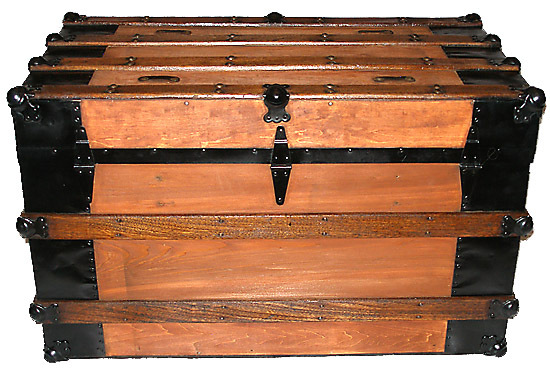 While we have some beautifully refinished Trunks for sale, we are glad to help you with some information to help you work on your own trunk. 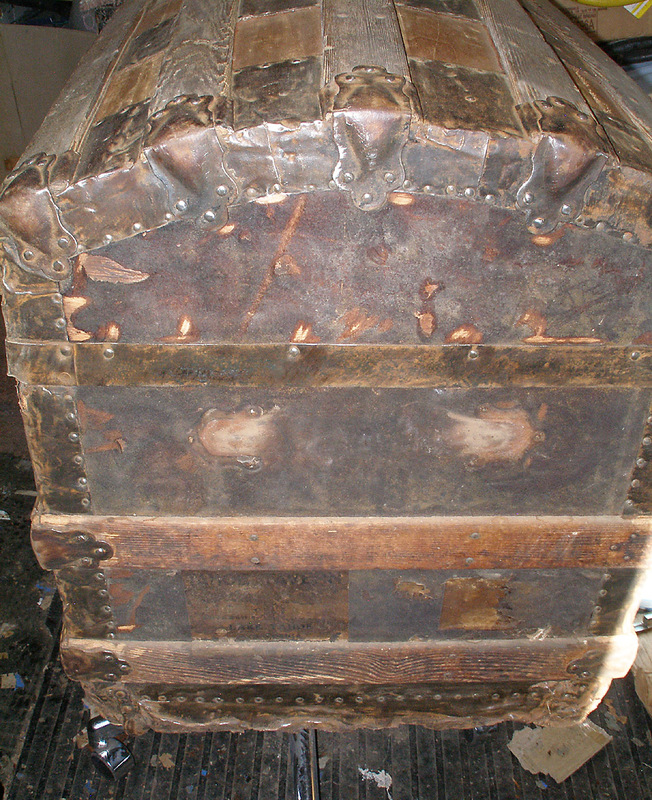 These photos show how many of our trunks come to us and how we refinish / restore them. 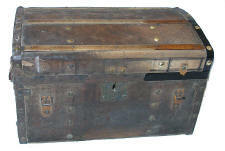 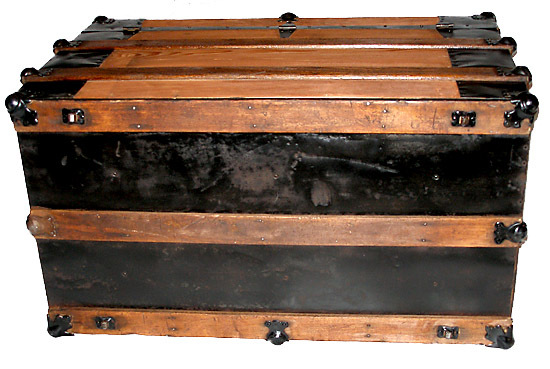 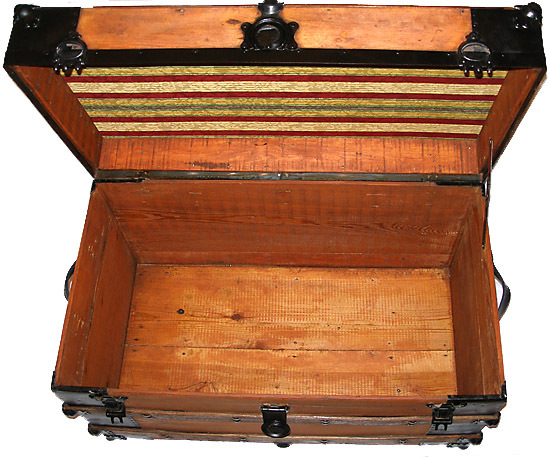 This Flat Top style Trunk dates to the later 1800's and was originally canvas covered and material lined. Lower on this page, You will see some of the techniques we use while refinishing our trunks like this Trunk to a Wonderful new look. 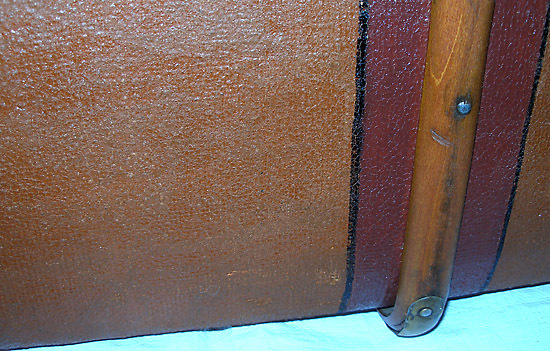 Interior of Flat Top trunk first cleaning Interior of Dome Top trunk first cleaning Glue, paint, and other various coverings offer a real challenge. 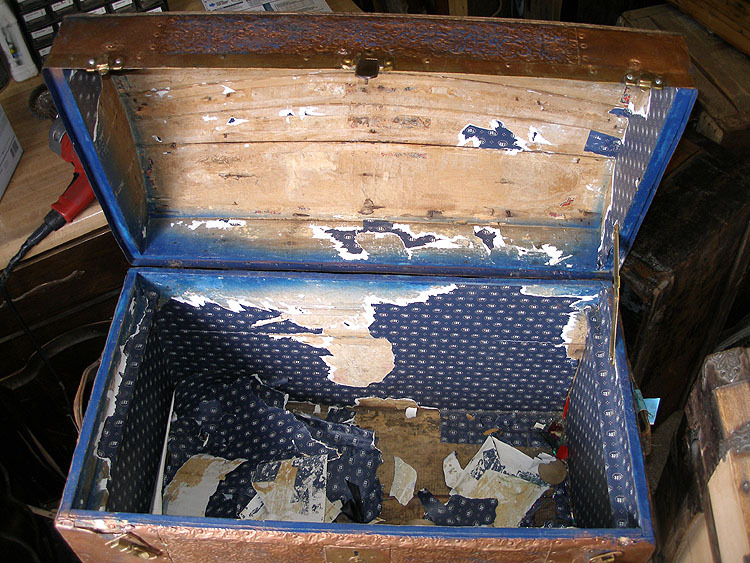 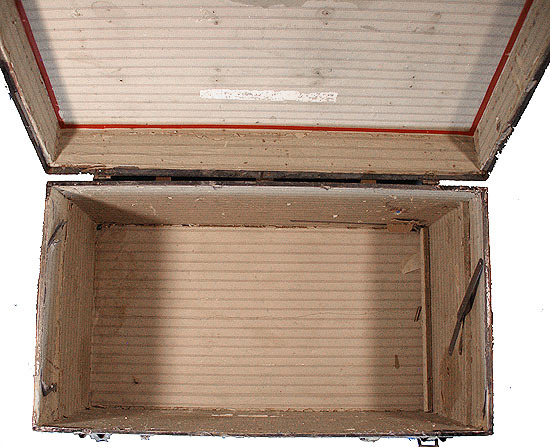 The first step to many trunks is to clean, and do a basic strip the interior of and paper, cloth, vinyl, canvas, or what ever material it has been covered, or re-covered with, in it's long life. 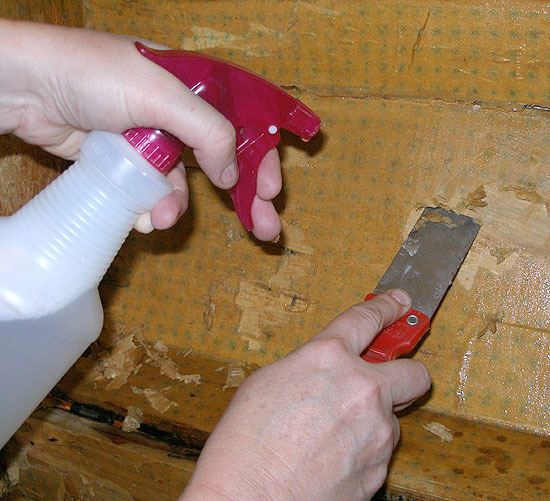 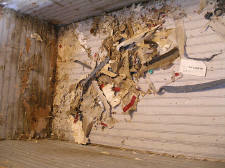 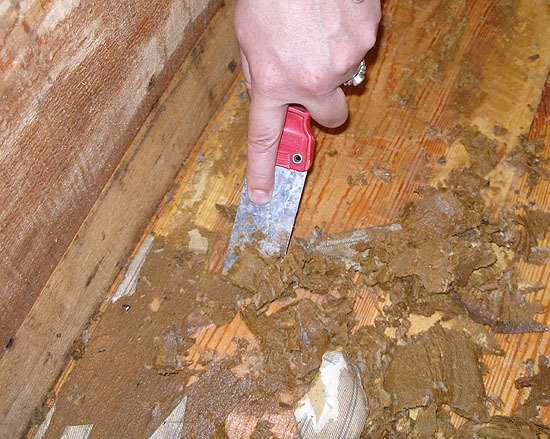 Sometimes, removing the interior paper involves using only warm soapy water. 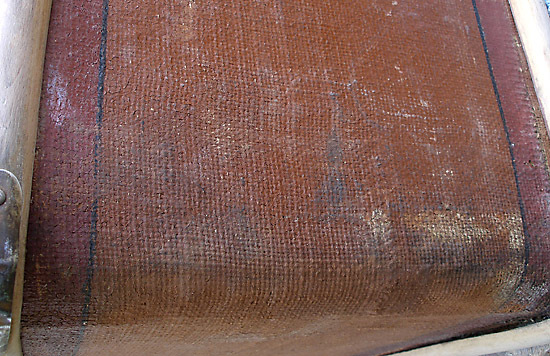 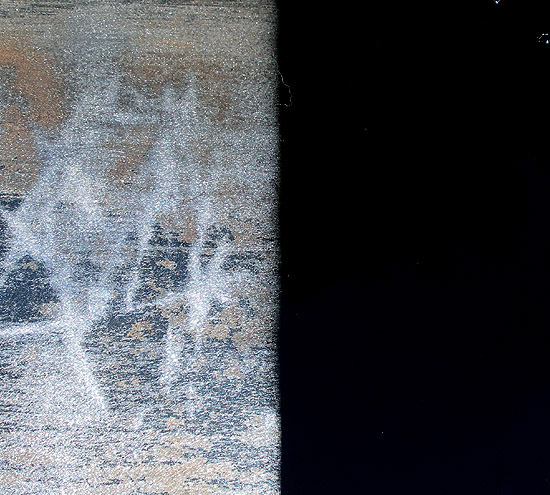 Other materials however, like fabric, canvas, leather, or layers of paper involve using more aggressive solvents. 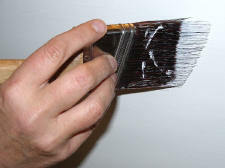 Professional paint strippers, adhesive removers, paint thinners, lacquer thinners, etc. In bad cases, we have had to use a heat gun. 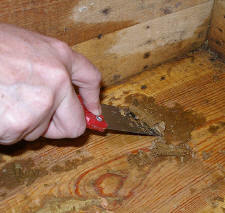 All these involve elbow grease' and a good scraper. 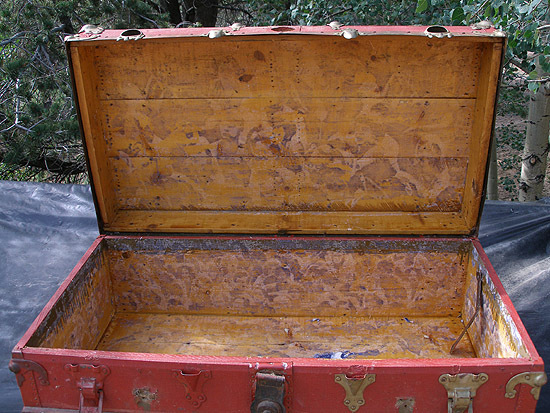 Nail removal is necessary for most trunks. 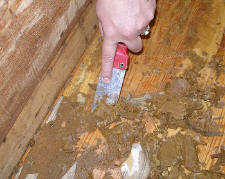 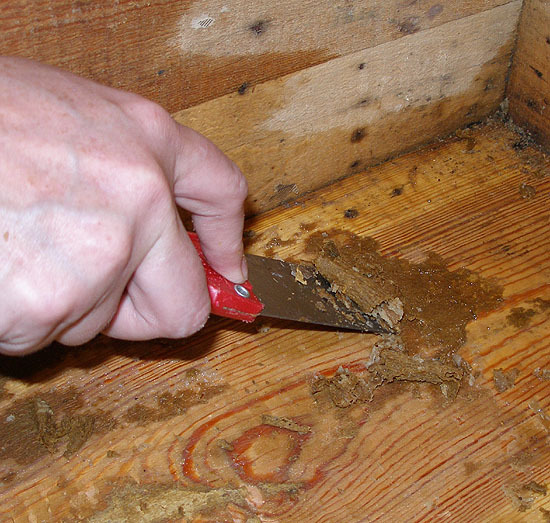 In order to remove, refinish, or replace parts, nails have to be removed. 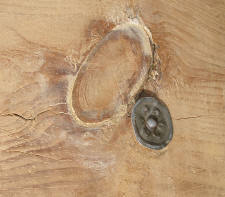 There are several steps to nail removal which does the least amount of damage to the Trunk. Replacing Handles is a common requirement. 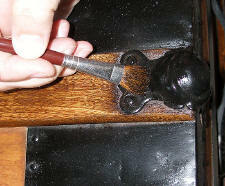 Handle covers, and handles must be removed, and new leather handles, are replaced with the refinished handle covers. Replacing nails properly involves a special technique utilizing specialized tools. 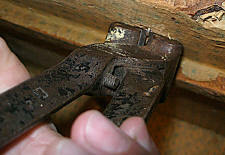 'Turning the Nail' properly is a requirement in replacing nails. 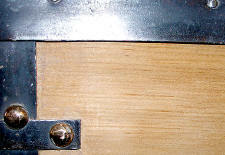 Nails are special nails, and come in several sizes, and metals. 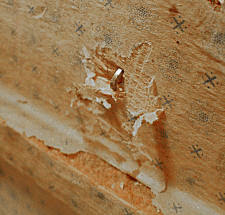 Stripping multiple layers of old paint from the metal is often a challenge. 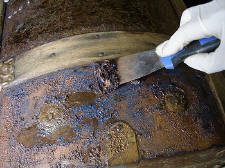 Stripping solvents, sanding, and wire brushing are often needed to get to the primary metal base. 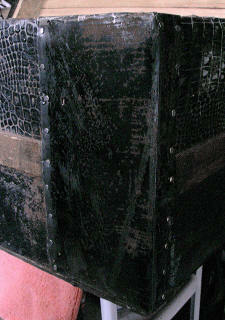 We generally do not strip all the way to metal since we like some of the original character of the aged metal surface. 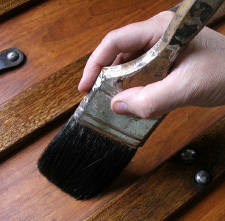 Sometimes exposing the metal and resurfacing it to a new smooth finish is desired. 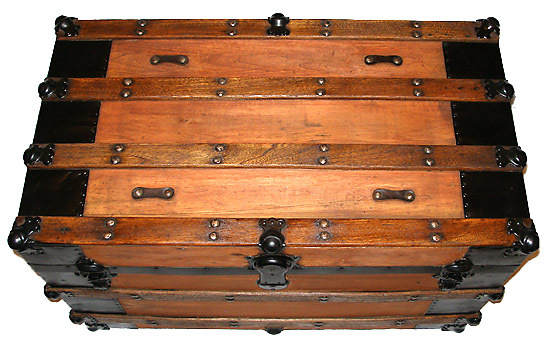 This is a personal preference based on the trunk. place, corners folded, and nailed. 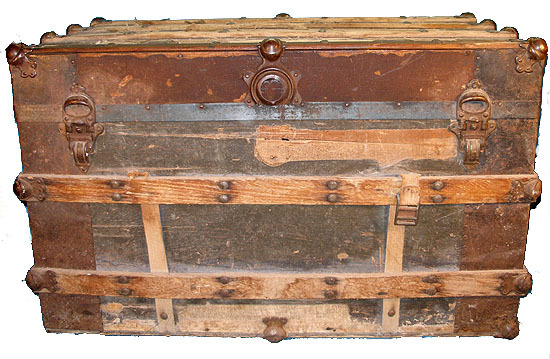 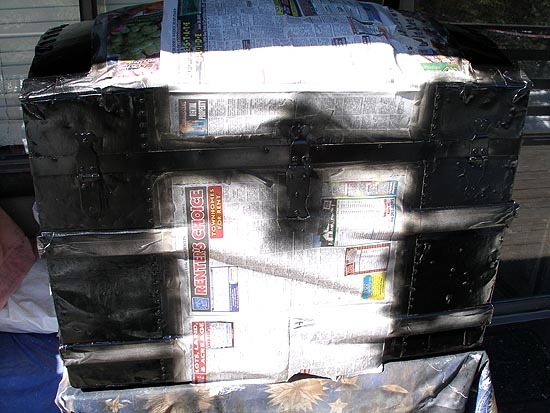 Many trunks have damage to their exterior sheet metal, or tin. 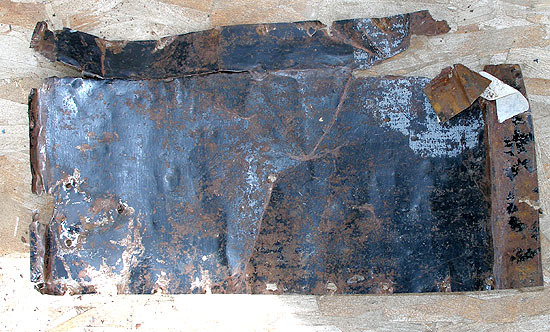 You can buy sheet metal and replace it. 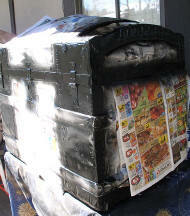 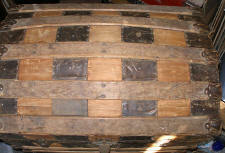 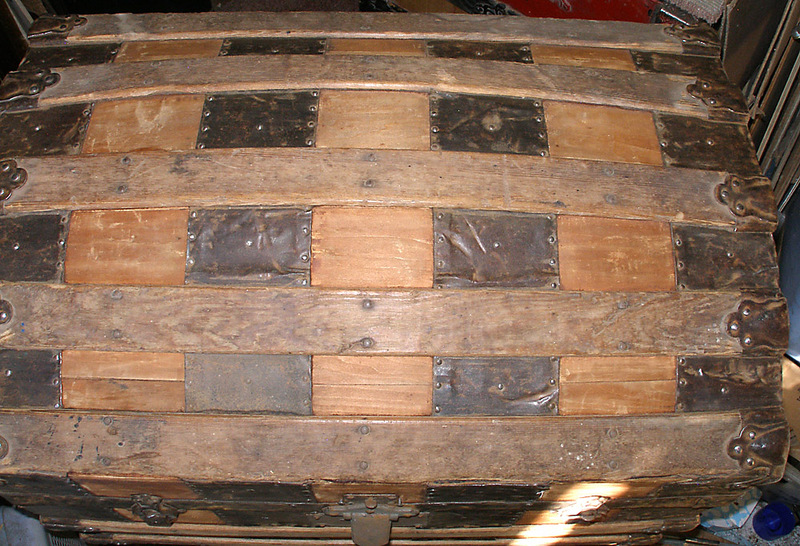 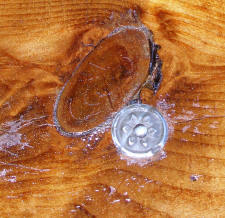 We try to salvage trunks and use the salvage tin since it is aged,, and matches the rest of the trunks a little closer. 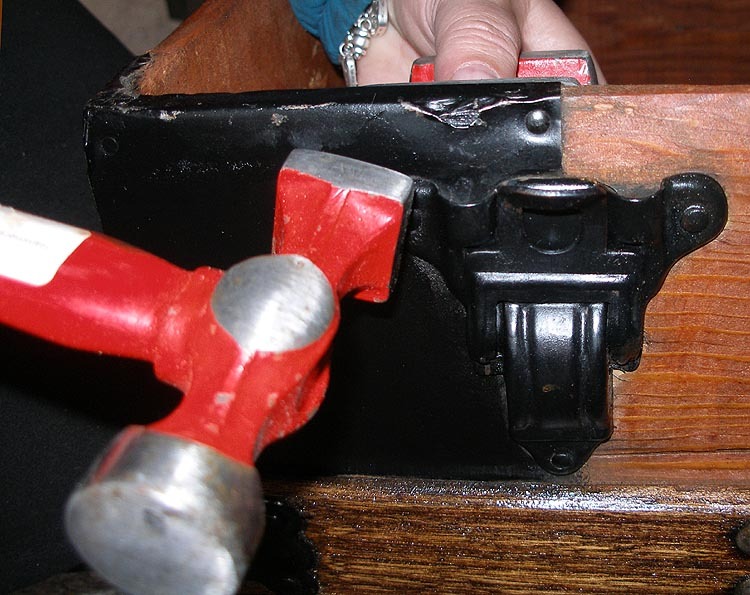 We often see trunk repairs which we have to repair properly. 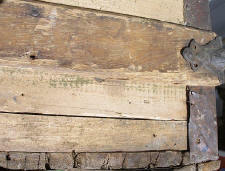 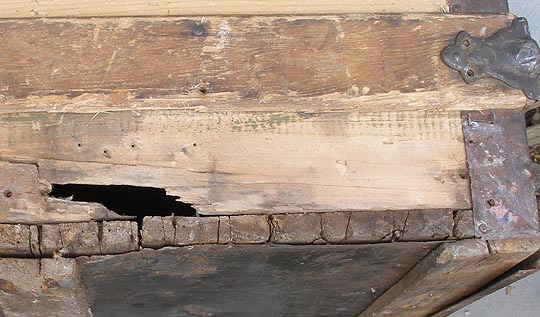 We often need to repair / replace wood, and metal . 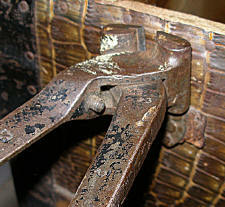 Reproduction parts are also often needed. 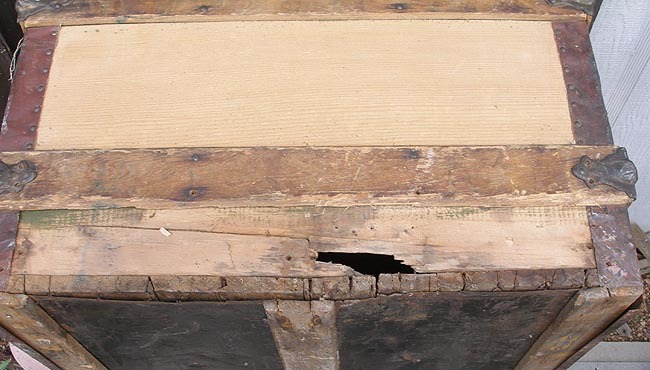 The 1st repair below took approx. 6 hours to remove the old damage, cut out the damaged wood, cut a replacement (we used the unused tray rail wood from the same trunk in this case) secure and fill the wood replacement, and replace new metal. 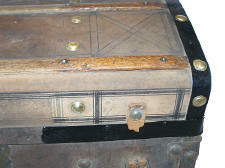 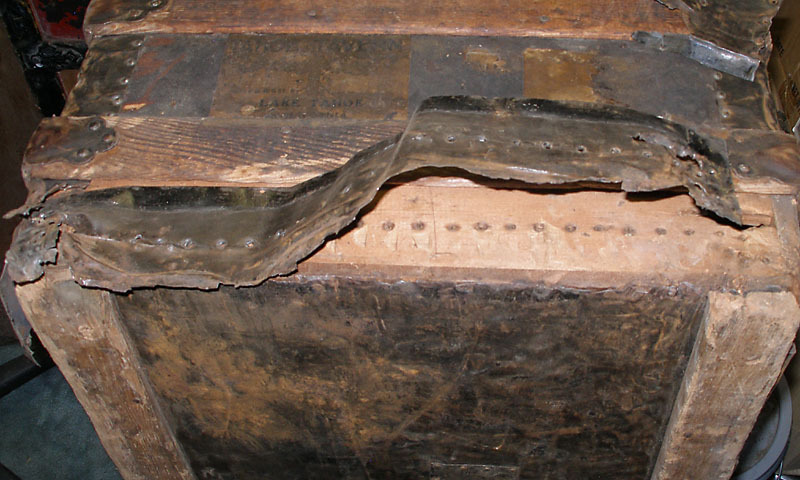 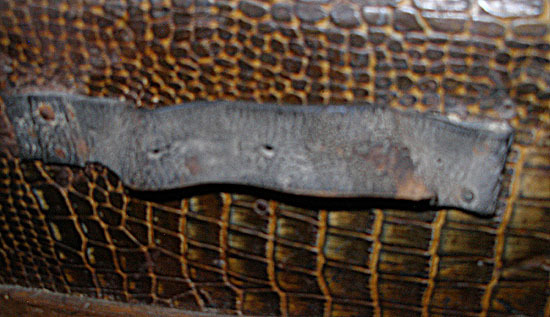 Trunk before repair work, The Cigar tin from the photo below center was used to cover the hole when we got this one. 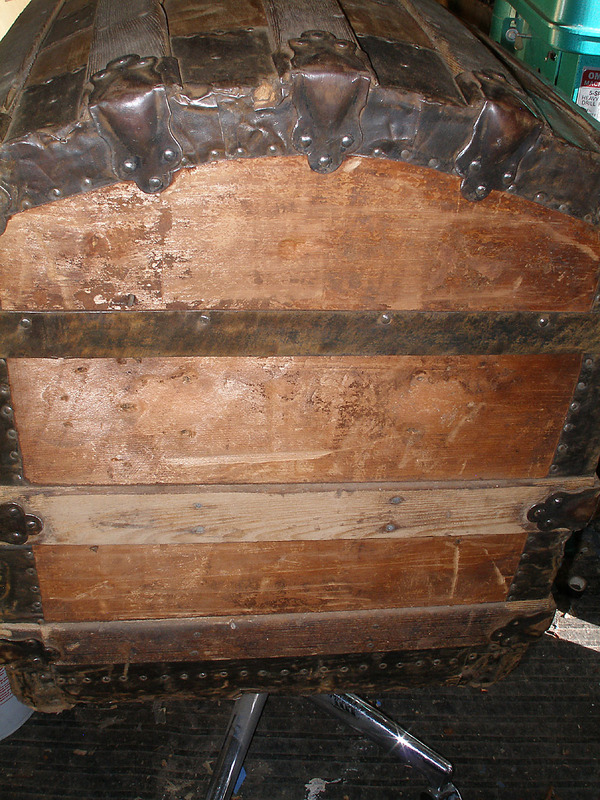 Trunk after the repairs made and now to be refinished. 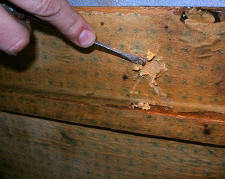 See the photos below to see how we made this repair. damaged wood is replaced The replacement is secured in place, and glued and filled to be solid and secure. 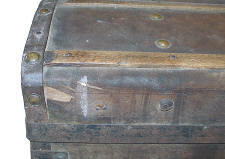 The missing tin is replaced with new metal, and is ready for refinishing . 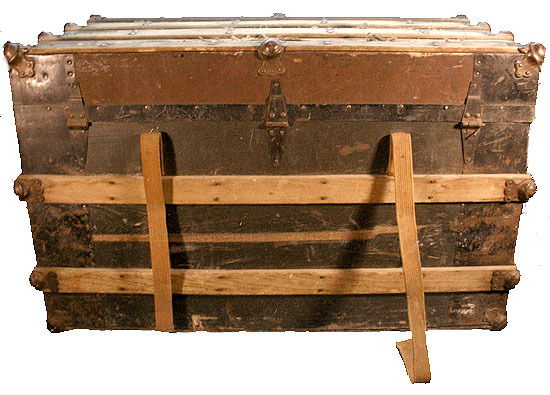 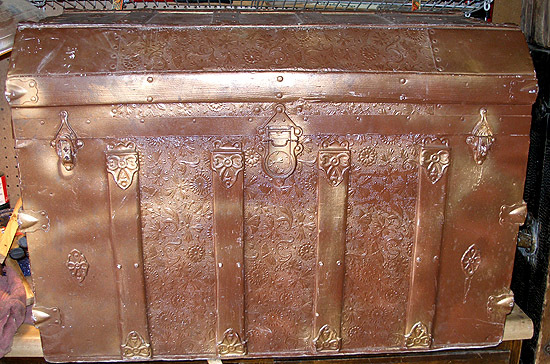 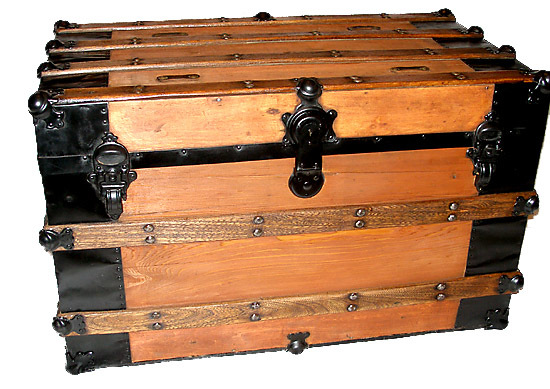 Metal repair/ refinishing, and replacement is often needed when refinishing an Antique Trunk with damaged, rusted, or missing parts. 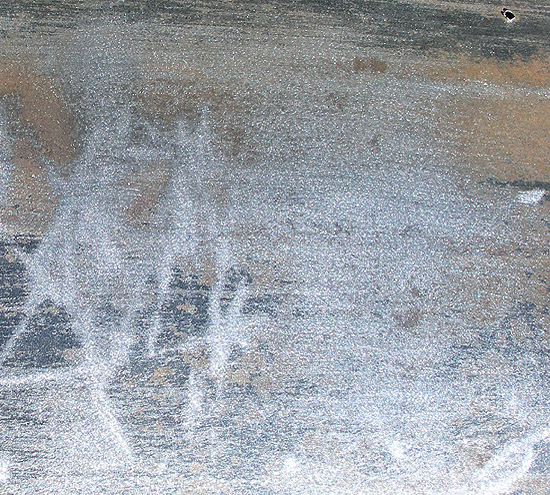 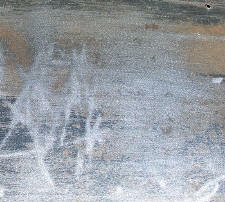 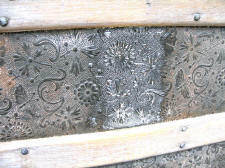 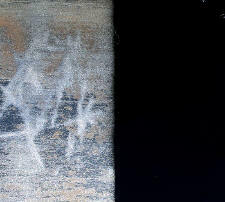 Very Rarely, when we can, we will clean it, and refinish the imprinted patterns. 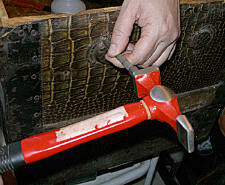 Sanding is the primary function in preparing a trunk for refinishing. 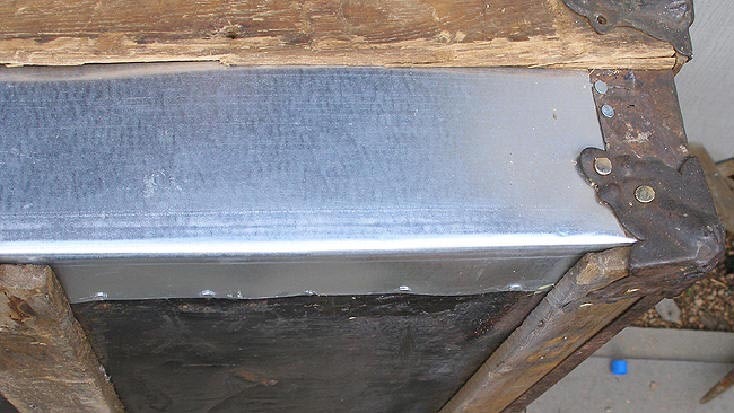 Wood, and metal surfaces both require good preparation before finish work can begin. 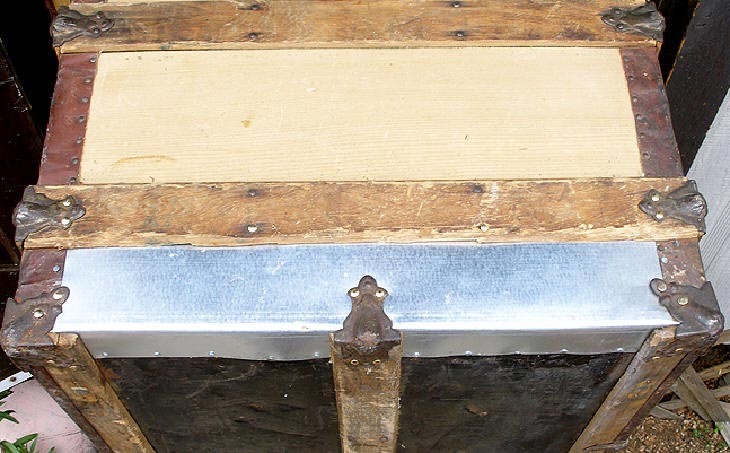 We generally do 2-3 steps. 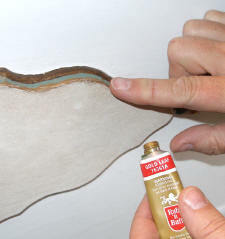 (1) Initial stripping of surface materials or coverings, (2)First sanding with aggressive type sand paper, (3) finish sanding with progressively finer grades of paper. 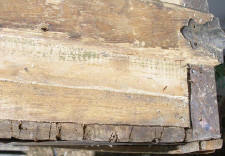 Once the exterior wood and metal is cleaned and prepared, then you can really see what you are working with. Decisions on the type and decor of the finish to use can now be made. 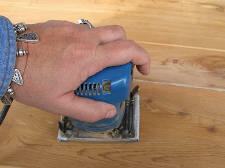 Once again, preparation of the surfaces before finish work is critical. 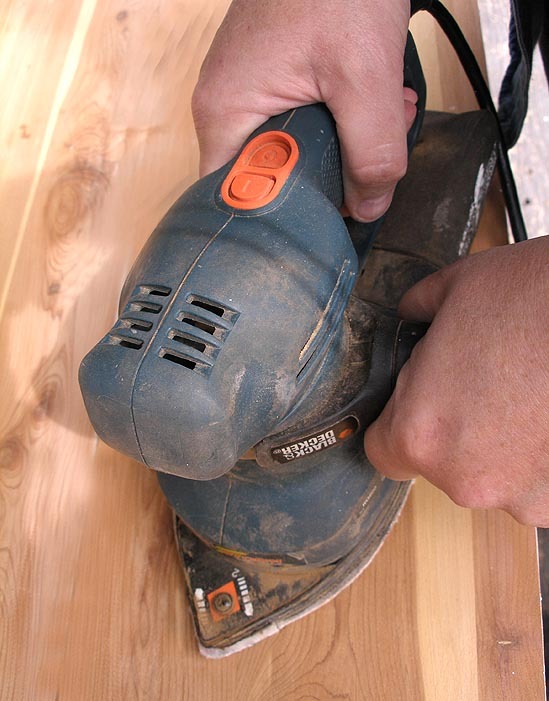 Don't cut corners here, as it makes all the difference. 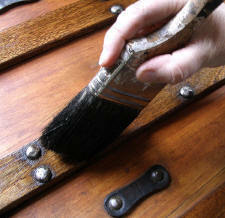 Staining and Varnishing are the 'icing on the cake'. 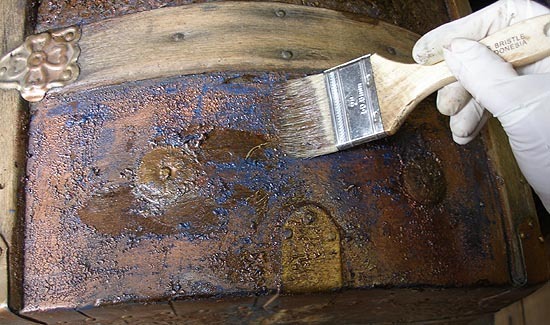 We generally use high quality oil based stains, and often mix our own colors to get the desired effect we are looking for. Color blending is often necessary as different portions of the aged wood will take the stain differently, and you want an overall matching color. When it comes to the final finish, we choose to use a high quality Tung Oil, Varnish, or furniture grade beeswax finish. 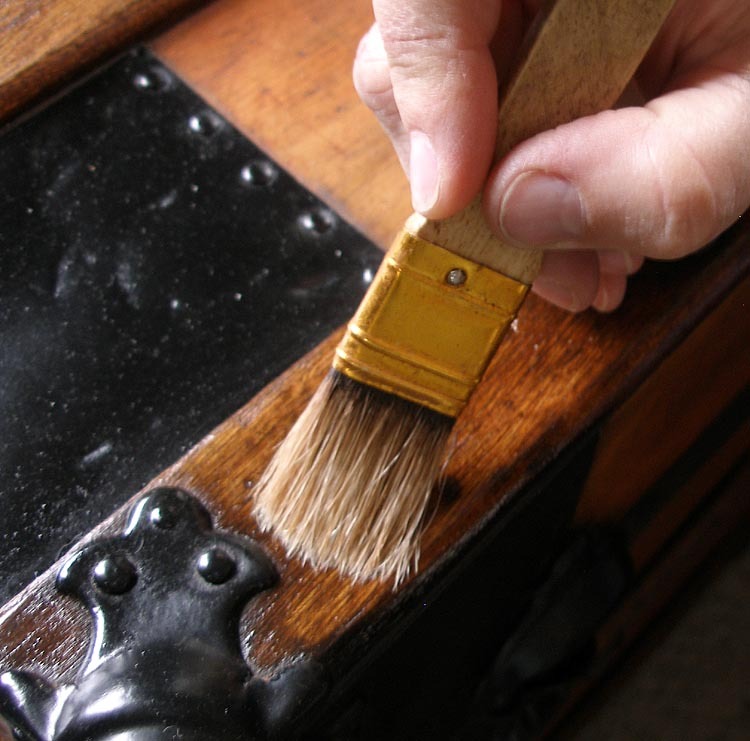 Generally with varnish or Tung oil finishes, we apply 3-4 coats with fine sanding between coats to build up a nice finish. 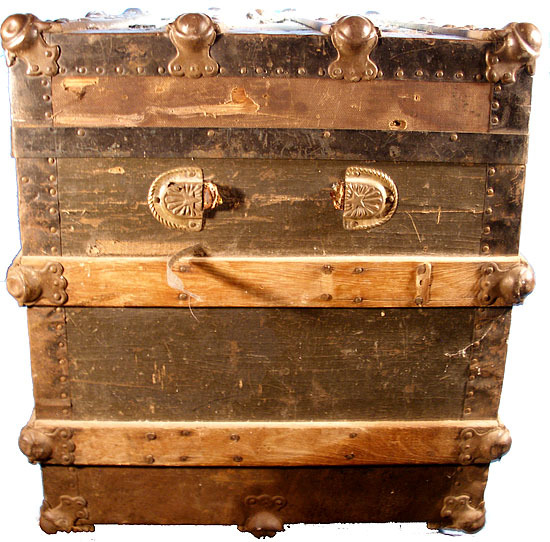 On trunks which we are looking for a more aged look, we will often stain, and then beeswax several coats to achieve a nice smooth finish. 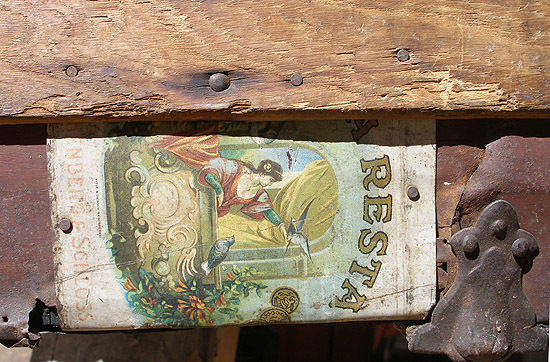 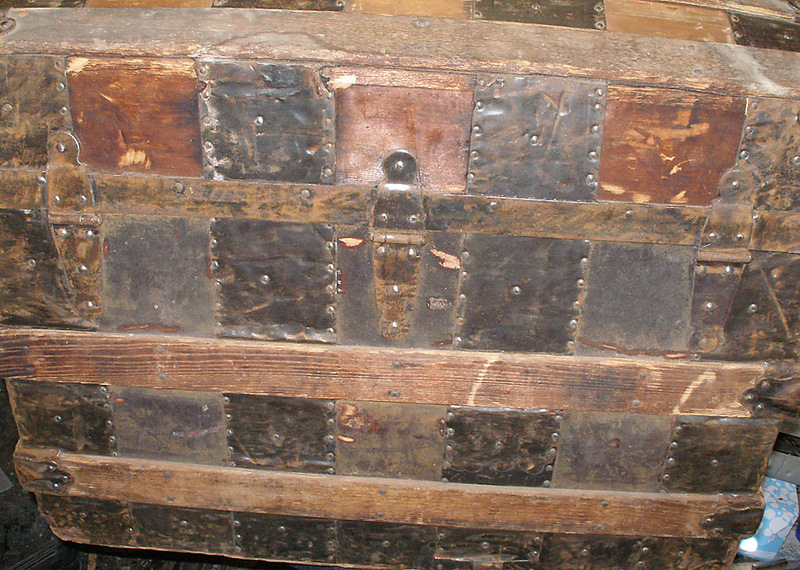 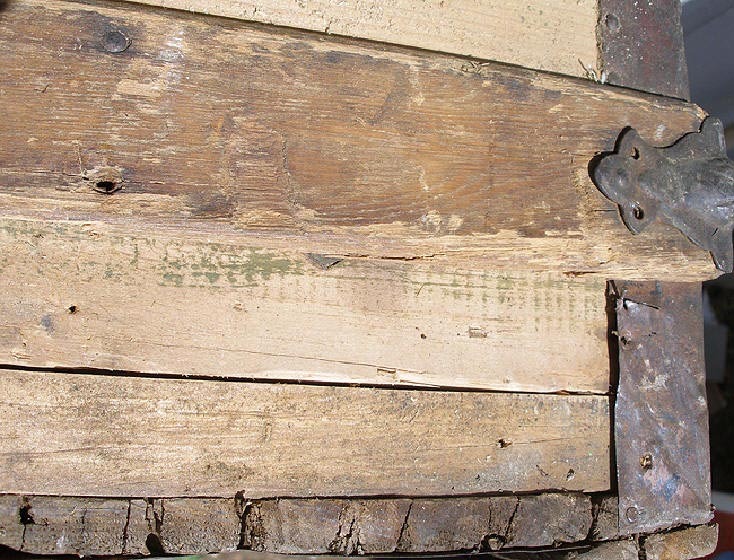 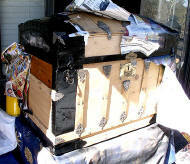 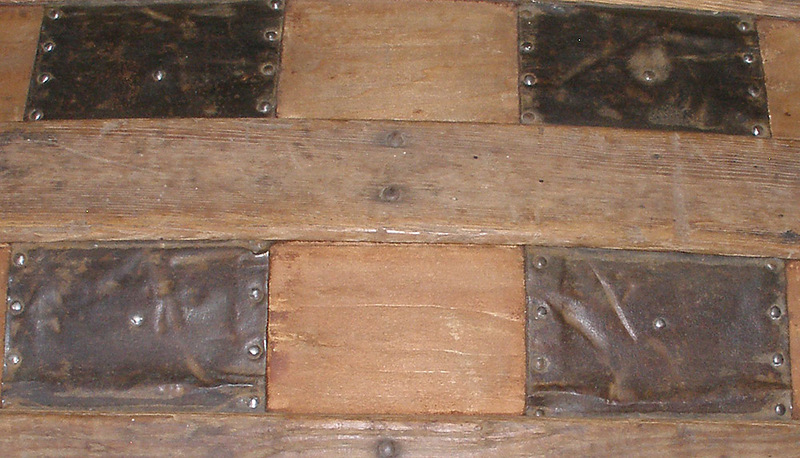 Painting the exterior of an antique trunk, chest, or woodenware box, is not what we generally like to do. 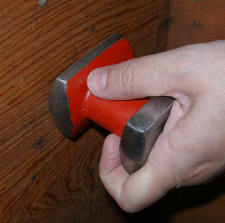 However, sometimes the project requires this. In the case of wood, or canvas which has been previously painted, it will often require painstaking time and effort, not to mention possible major sanding, to get to the bare wood. 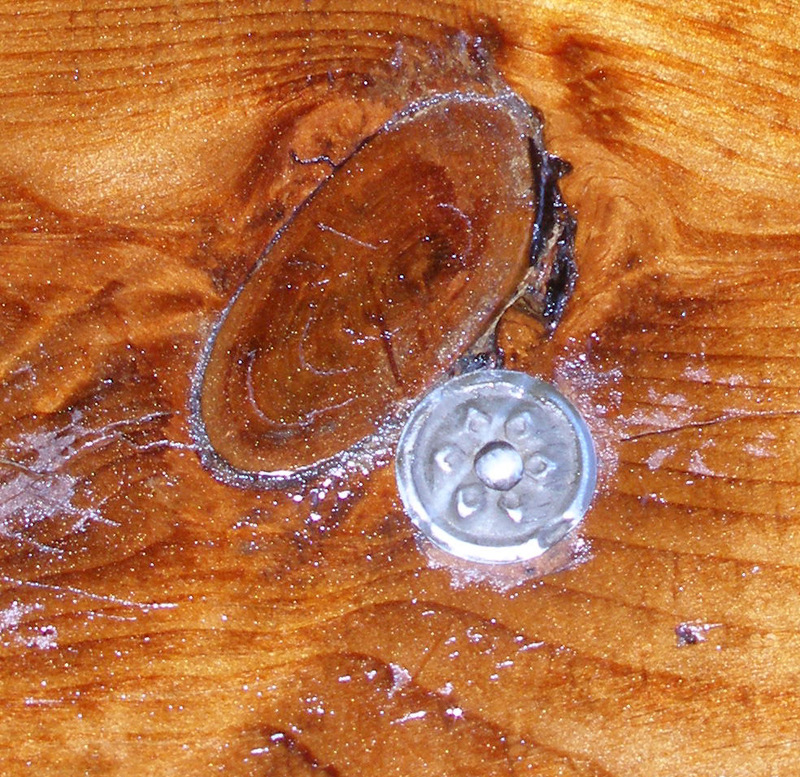 This can mean changing the original lines of the wood. 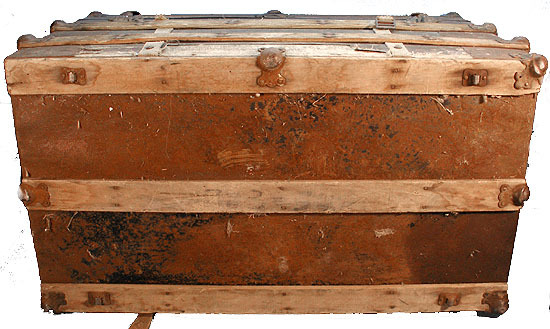 In these cases, we have to decide if the potential selling price of the trunk justifies the extensive time and effort. 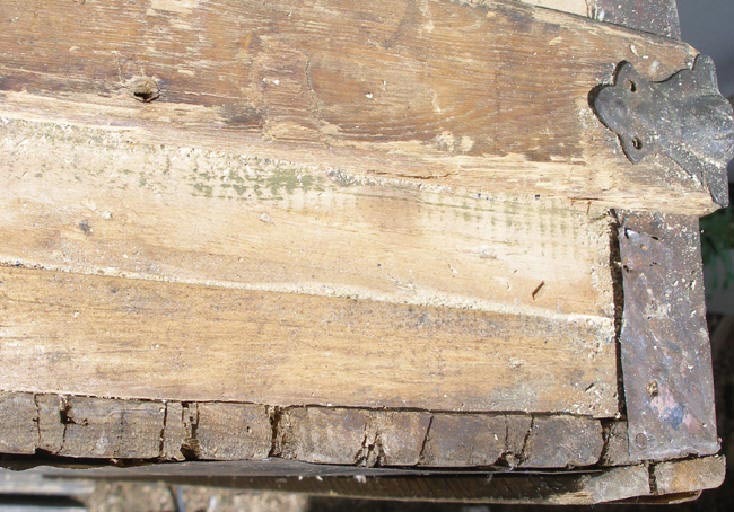 For us, it generally does not. 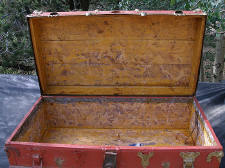 For you, if your trunk is sentimental, it might be. 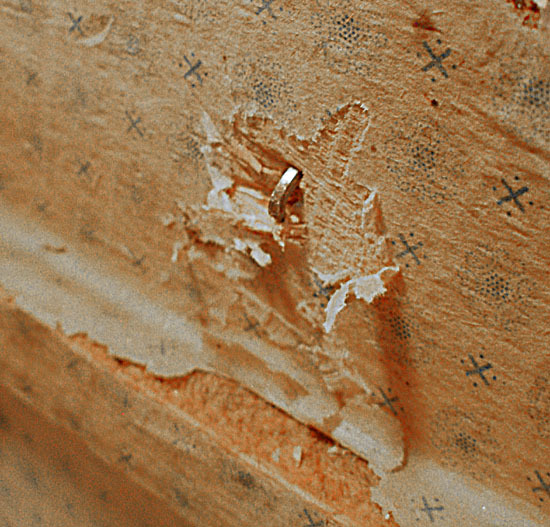 Just be careful not to do more damage than good. In the case of wood painting, we choose to do multiple layers of high quality paint. 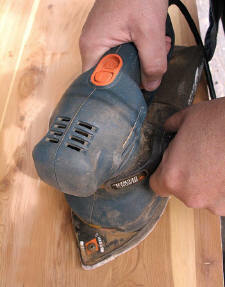 We start with a primer coat, and add layers as needed with sanding in between. 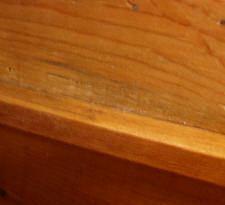 The finish is not' Furniture company grade' but it is very nice, and keeping with a trunk of it's age. 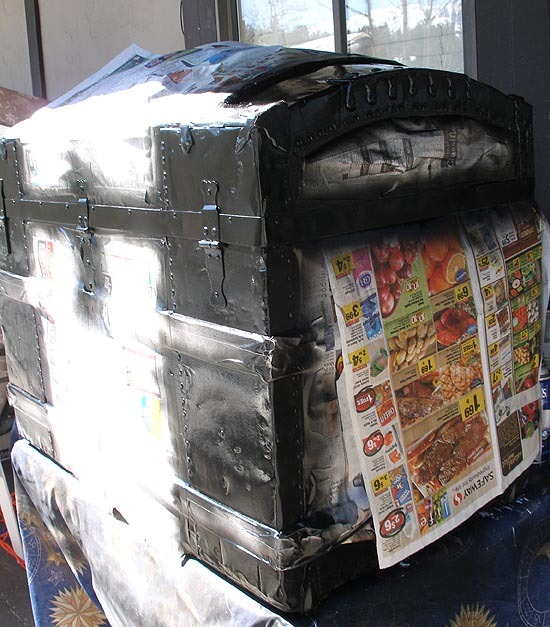 In the case of metal, we generally spray all the metal we can with a high quality metal rust inhibitor type paint. Now some people say spraying is not good, but my car, appliances, metal furniture, etc, have sprayed finishes, and they are done that way since it results in a better finish . 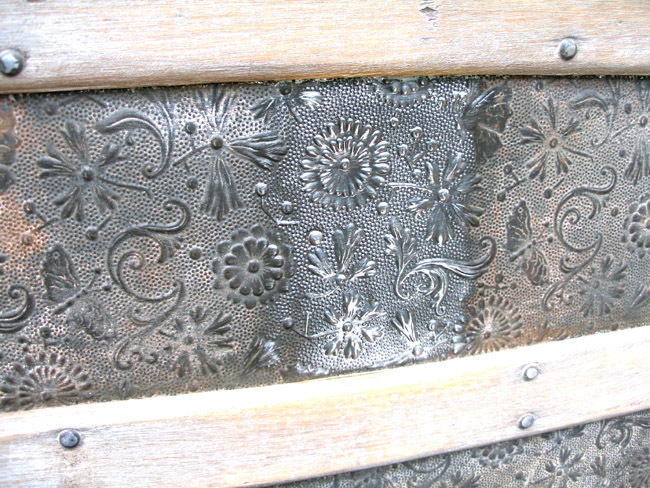 We hand paint the majority of the decorative metal elements as they are intricate, and need small precise work. 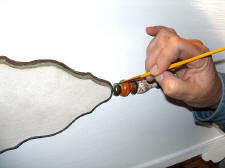 Decorative painting and accent touches are very desirable, and require an artist touch. These often make all the difference.